Awesome reminder that love and kindness are still alive and well! With all of the vile rhetoric and constant bickering between folks in America today who are more divided than ever along political lines, it can be easy to forget there’s still a lot of good happening in the world. Therefore, it’s nice to have a change of pace now and again, taking time to smell the roses as it were, examining the wonderful things people still do for each other, despite the polarization reported on by the media. 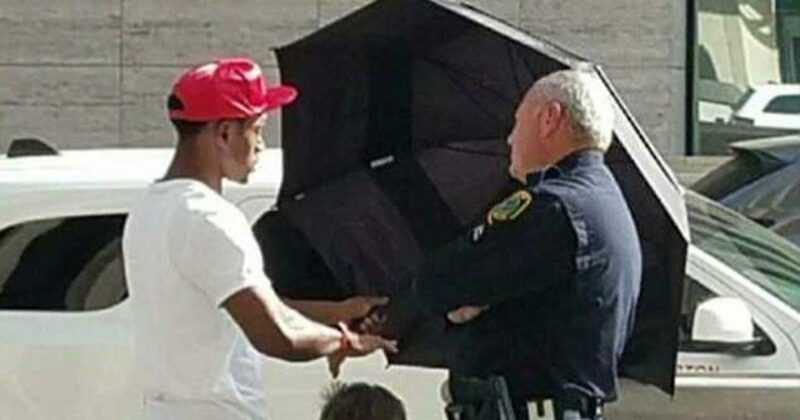 There’s a picture going viral that proves love for one’s neighbor and acts of kindness are still a thing that exists in 21st century America. 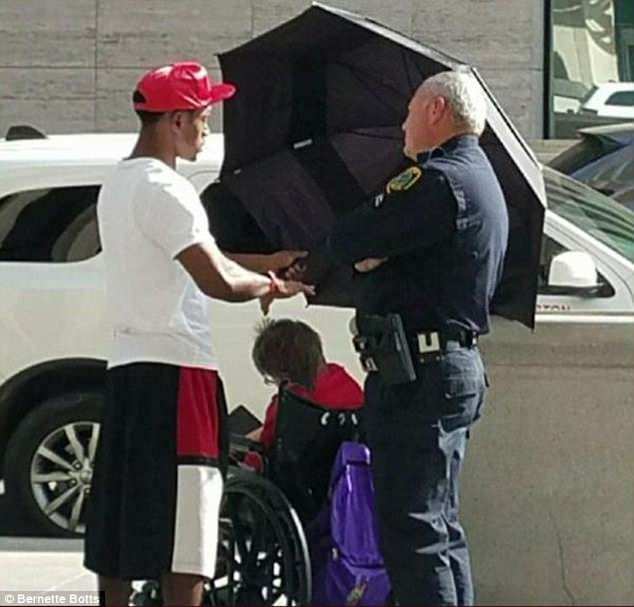 The photograph features a young Texas teenager using an umbrella to shield an elderly woman from the blazing summer sun. ‘It was unbearably hot,’ Louis Jordan remembered as he arrived at his mother job’s in Houston to give her a lift back home. Swiftly realizing that an umbrella had been stowed away in the trunk of the car, he grabbed the device and brought it over to help shield the woman from under the sun. ‘Come to find out, it was going to be a little longer for METRO Lift to come and get her,’ he said. ‘So we ended up waiting out there for an hour and 45 minutes. As if this story isn’t enough to tell you about the stellar content of this young man’s character, his mother said it’s not the first time he’s performed an act of kindness. During Hurricane Harvey, he risked his life to rescue his grandmother. Now, some folks might be wondering why an act of kindness is news, after all, how many thousands and thousands of these kinds of things happen every day and don’t land on news? What makes this one special? Well, for starters, this was caught on camera. Secondly, it’s not that this act is somehow better than all the other acts of love and goodness happening in the world, it’s just that this is a good reminder that the other ones are happening, even if we don’t see them. It’s protection against cynicism, despair, and discouragement. Here’s to hoping more and more people follow in Jordan’s footsteps.